For the last few years, I have been making lamps of various sorts out of repurposed items like vintage toasters, cheese graters, funnels, vegetable peelers, and the like. The objects get a new and different lease on life. From an interface point of view, many of the resulting projects have an intentional user-unfriendliness to them. 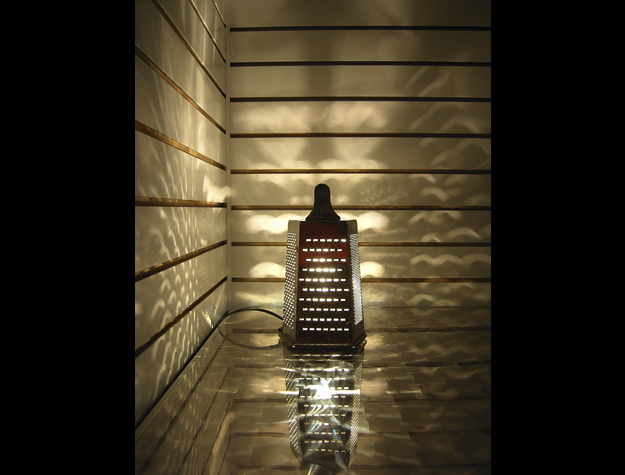 For example, a bedside lamp, constructed from a large cheese grater, throws a beautiful pattern of light on neighboring walls. Being touch-controlled though, it means that a poorly-executed swipe to turn it on in the pitch-black of night could easily result in a shredded finger. Other pieces in the series exhibit other forms of wattage whimsy – a heavy-duty switch in a block of concrete results in less illumination than a night light, an inverted funnel flickers with an eternal flame, and a vintage toaster glows like a low-rider.